The fashionable all-rounder at work! 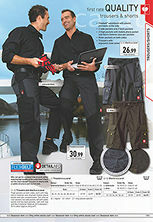 This clothing line is available in trendy camouflage colours which are particularly dirt resistant – an absolute all-rounder at work. Made of easy-care blended fabric. Thigh pockets on both sides, each with flap, Velcro fastener and attached mobile phone pocket with pen compartments. Two internal ruler pockets. Two side pockets, left with safety pocket and two back pockets, right with flap and Velcro fastener.